Our OFFERS are on our dinner menu and are meant for at least two people to enjoy a combination of courses and are prepared according to the number of people. For groups we recommend our group menus. We use allergens such as milk, wheat, nuts and seeds and cannot guarantee that our dishes are free from cross-contamination. Please inform our staff of all intolerances and allergies. They will do their best to provide advice on alternative dishes. The offer is available on Hverfisgata, Lækjargata and in Hlíðasmári. It is not available in Kringlan. String beans cooked with coconut, garlic, ginger and chilli. Cooked with tomatoes, onion and spices. Potatoes cooked in a tasty blend of spices. 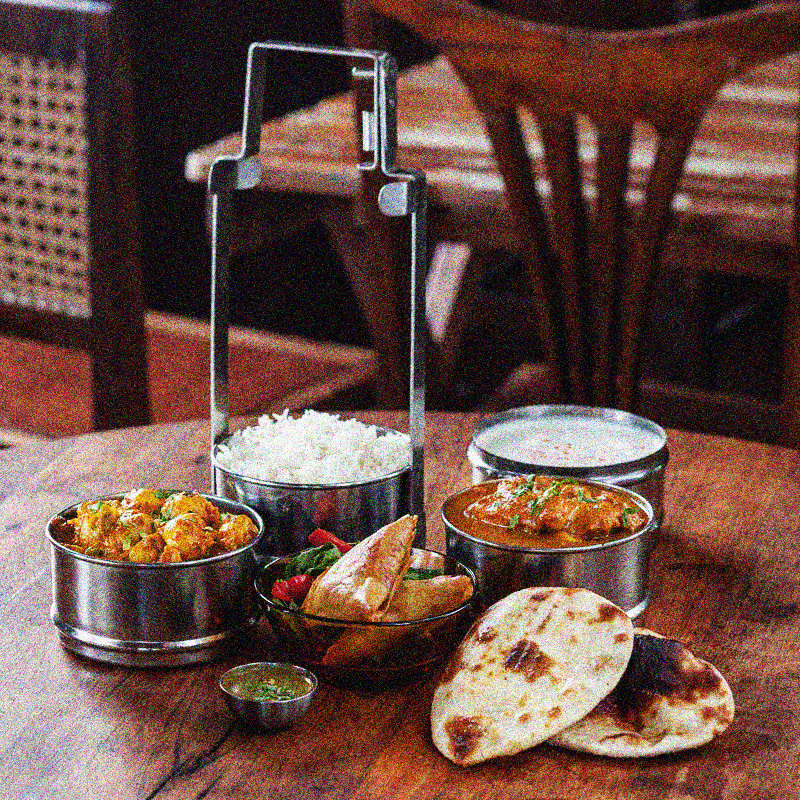 In our MIÐ-VEGAN-THALI the dishes are served with lemon rice instead if basmati rice and a vegan chapati. Lunch-thali 2.590 KR. / Dinner-thali 3.290 KR. For groups of 8 or more people we recommend one of our group menus. Select the one which suits your occasion! You select two chicken courses and one vegetarian course from the menu for your group to share. Accompanied with basmati rice, raitha and garlic naan. Price per person is 3.290 KR. You select one small course and three main courses (chicken, vegetarian or vegan) from the menu for your group to share. Accompanied with basmati rice, raitha and garlic naan. Price per person is 3.590 KR. * Please note that you can replace chicken with lamb for an added 200 KR per person and/or select lamb samosa as a starter for 100 KR per person. Call and place your order at 578 - 3838 or email us at pantanir@hradlestin.is and we will help you put together the perfect combination for your occasion.